Mary Jane White, an acclaimed translator of Russian poetry, will read from her forthcoming collection of poet Marina Tsvetaeva’s Berlin and Prague verse, Poems of an Emigrant: After Russia, Poem of the Hill, Poem of the End, and New Year's. Mary Jane White graduated from Reed in 1974 and holds degrees from the University of Iowa Writers’ Workshop (MFA, poetry), and Duke University and the University of Iowa law schools. Over the years, her work has appeared in many anthologies, journals, and literary magazines, including The American Poetry Review, New Directions, The Hudson Review, The New England Review, The Georgia Review, and Poetry Daily. 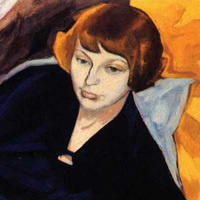 Her translations of Marina Tsvetaeva are included in several books and anthologies. Sponsored by the Russian department. Free and open to the public. The Psychology Building is located on the east side of campus and corresponds with the West Parking lot, on the campus side.